2. Peel, core, and mince the apples. Toss fruit in sauce pan with the water, brown sugar, cinnamon, and nutmeg. Bring to a simmer and cook on Med-Low for 10 min, stirring often. 3. Use slotted spoon to remove fruit from sauce pan and set aside. Add 2-3 tablespoons of cornstarch to the juice left in the sauce pan, whisk until smooth. Put the fruit back in and simmer one more minute. 4. Place one piece of phyllo on the baking tray. Brush with butter, and sprinkle one teaspoon of breadcrumbs. Do this two more times, then add fourth and final layer (do not add butter or crumbs to top layer). 6. 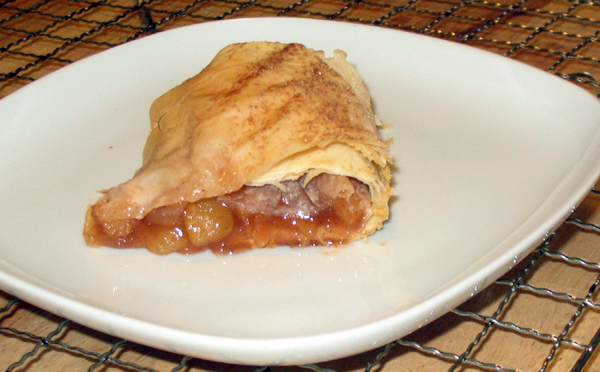 Use the parchment paper to support the pastry as you lift it, you’re trying to tuck it over and under the apple filling, and then carefully roll it over like so. Once you’ve got the first turn, peel the parchment paper back towards you. Keep turning it, and between turns try to smooth it with your hands to an even shape. Roll it up 3-4 times until it’s at the edge. 9. Bake 20 min until golden brown. 10. Cool on rack at least 5 min before serving.